Drawing games are awesome. They’re one of the few games I can get most of my friends and family who aren’t into board games to play with me. They are all also big fans of Taboo, and I’m a big fan of geekery. Now there’s a tabletop game that will combine all of the interests and help me pull more of my loved ones into the realm of gaming. 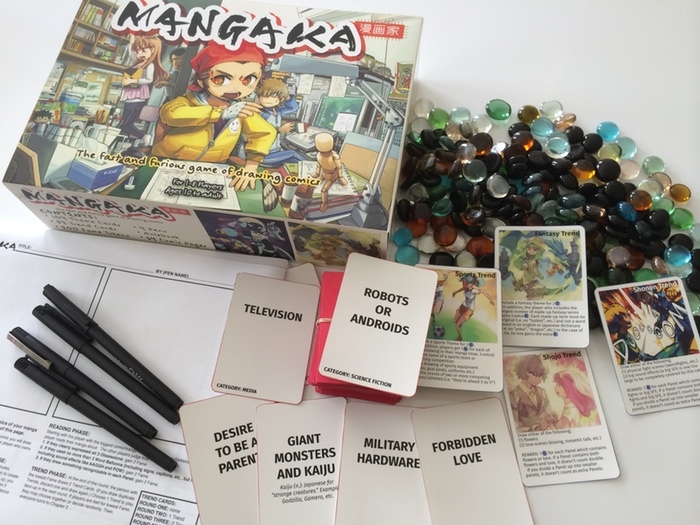 Mangaka is a fast-paced card game where the players get to be comic artists for four rounds. I got to talk to lead designer Jason Thompson and producer Jumana Al Hashal about this fabulous project. What are your artistic backgrounds? Jason: I’ve drawn since as early as I can remember, mostly inspired by science fiction illustrations and newspaper comic strips. I discovered anime and manga in college, around the same time I started reading Western comic artists like Neil Gaiman, Scott McCloud, and Donna Barr. After I graduated, I got a job at VIZ, the manga publisher in San Francisco (a branch of the Japanese publisher Shogakukan). I worked at VIZ for ten years, editing the English editions of Japanese comics by day, drawing and self-publishing my own comics at night. So I’ve always been into both indy comics and manga. Jumana: I am a designer. I make my living designing digital experiences and products for mobile devices. I majored in art as an undergraduate and in general love making things: art, short films, posters, and so on. How did the idea for Mangaka first crop up? Jason: In 2010, I was writing a manga-influenced graphic novel series called King of RPGs about a teenager who’s obsessed with tabletop gaming. As a joke tie-in with that story I started working on a project called Mangaka: The Roleplaying Game, which was an imaginary roleplaying game where you play a Japanese comic artist. Part of the game was that you would simulate your drawing deadlines by actually drawing a little comic in five minutes. I invited some friends over to playtest the game, and although for the most part it was pretty ridiculous (as intended), people enjoyed the little quick-drawing segment. I decided to expand the drawing part into its own real game, and four years of playtests later, Mangaka: The Fast & Furious Game of Drawing Comics was born. Jumana: I originally got roped into this as a one-shot roleplaying adventure that Jason created. Our friends showed up one afternoon, there was wine, dice, character sheets, and ridiculous themes and penalties. After hours of silliness and ROFL, it was clear that there was something quite unique taking shape there and I wanted to help bring it to life. So much of our lives is about controlling outcomes. We want to get everything just right in our personal lives, school, work, even when we are playing games, which actually results in us stifling our own creativity. I love Mangaka, because unlike any game I have ever played, it offers players a chance to unleash their creative side and shake off their inhibitions. The structure of the game encourages risk-taking, if you play it safe, you do not get that many points. You cannot control what comes next, so you cannot plan & have to improvise and make snap decisions. Finally, you have such a limited amount of time and great recovery mechanics that each round is a fresh start, a new chance at winning, and there is no time to dwell on mistakes. You must pick up your pen and start again when the timer starts. For adults, and for me personally, Mangaka is just the antidote to a creative block at work. For kids, I feel it is a perfect way to help them build resilience, confidence, and creative thinking. What would make someone a successful player of your game? Jumana: We always get asked if you have to be good at drawing to play, and the answer is no, much like you don’t need to be a musician to play or win at Rock Band and don’t need to be an artist to play Pictionary. A successful Mangaka player is anyone who wants to have fun, enjoys silly stories, and is willing to surprise themselves with their own abilities. Imagination, storytelling, and creativity is a muscle, you build it by exercising it. We recommend the game for tweens and up in groups of 2-8 players. However, if you are an artist and want to use this game as a creative prompt, there are rules for solo play. Jason: Making comics is like jumping into a swimming pool: you just gotta jump in, and once you’re doing it, it’s really fun. The confidence to jump in—to put the first lines on paper—is the most important thing, and once that happens, it’s amazing how everyone loosens up and “warms up” their artistic abilities from Round 1 to Round 4. We worked hard on the rules to make sure that players weren’t judged on their drawing ability; after all, it’s comics, so you can use words if you can’t show something in pictures. 😉 Basically the important things are cleverness and speed: creative storytelling under deadline. I’m looking forward to making comic artists out of my friends. What are some of your favorite tabletop games? So many good ones, and a few I haven’t heard of yet. Tips for people who want to get into making their own games? Jumana: I highly recommend the Art of Game Design by Jesse Schell, it provides a great overview of the psychology behind fun and gameplay. Jason: Playtest, playtest, playtest! Play the game as much as you can with as many different people as you can! Oh, I will definitely check out the Schell. What snack is best for a round of Mangaka? Jumana: Keep liquids in sippy cups and travel mugs; people cannot be held responsible for their limbs while laughing out loud (can you spot the coffee stains in our kickstarter video?). You want to maintain a good grip on your pen, so nothing too greasy, although Cheetos stains can be applied artistically, but you don’t get extra points for that. Thanks for talking with me, Jumana and Jason! Mangaka was recently selected as Kickstarter Staff Pick, so congratulations to you all. Readers, go check it out before the Kickstarter ends on May 25th.